Chronic Granulomatous Disease (CGD) is a rare inherited disease but is of importance as the study of the condition has helped in the understanding of the phagocyte oxidase system. The inheritance is most commonly x-linked. Affected individuals suffer from recurrent infections, particularly with staphylococci. CGD is a primary immunodeficiency that affects phagocytes of the immune system and leads to recurrent or persistent intracellular bacterial and fungal infections and to granuloma formation. In approximately two-thirds of patients, the first symptoms of CGD appear during the first year of life in the form of infections, dermatitis (sometimes seen at birth), gastrointestinal complications (obstruction or intermittent bloody diarrhea due to colitis), and a failure to thrive. The clinical picture can be quite variable, with some infants having several of these complications and others appearing to be far less ill.
Cutaneous disease occurs in 60-70% of patients. There is a poorly explained failure to switch off the inflammatory reaction with formation of granuloma in many sites and poor wound healing. CGD manifestations include recurrent infections; multiple granulomatous lesions of the lungs, liver, lymph nodes, and GI and GU tract; abscesses; lymphadenitis; hypergammaglobulinemia; elevated ESR; and anemia. Diagnosis is made by the demonstration of an inability of the neutrophils to reduce nitroblue tetrazolium dye (NBT test), and the defect can be further defined by molecular techniques. The nitroblue tetrazolium (NBT) slide test is used for screening defects in NADPH oxidase. 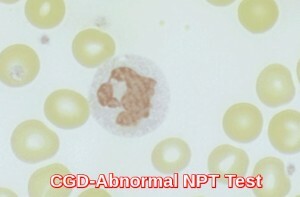 In this test, patient neutrophils are exposed to a stimulus, incubated with NBT, and made into a smear on a slide. Under the microscope, the number of neutrophils with dark granules of reaction product are counted. Normally, more than 95% of the granulocytes will be positive as shown above. In chronic granulomatous disease (CGD) there is an absent or reduced function of the respiratory burst, which is the intracellular process in neutrophils that is dependent upon the enzyme NADPH oxidase, which produces oxygen free radicals used to kill phagocytized organisms. 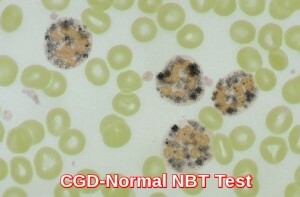 The abnormal NBT test in CGD is shown below in which <5% of neutrophils stain. Treatment is continuous prophylactic antibiotics, particularly trimethoprim/sulfamethoxazole (Septrin) 160/800 mg po bid. Oral antifungals are given as primary prophylaxis or are added if fungal infections occur even once; most useful are itraconazole po q 12 h (100 mg for patients < 13 yr; 200 mg for those ≥ 13 yr or weighing > 50 kg), voriconazole po q 12 h (100 mg for those weighing < 40 kg; 200 mg for those weighing ≥ 40 kg), or posaconazole (400 mg bid). Interferon gamma may reduce severity and frequency of infections and is usually included in the treatment regimen. Usual dose is 50 mcg/m2 sc 3 times/wk. Granulocyte transfusions can be lifesaving when infections are severe. When preceded by pretransplantation chemotherapy, HLA-identical sibling bone marrow transplantation is usually successful. Gene therapy is under study. 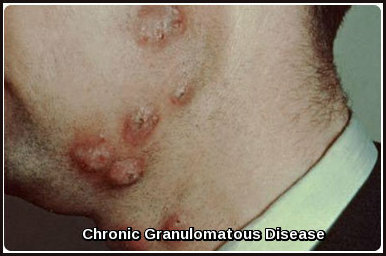 Roos D, de Boer M. Molecular diagnosis of chronic granulomatous disease. Clin Exp Immunol. 2014. 175(2):139-49. Segal BH, Romani L, Puccetti P. Chronic granulomatous disease. Cell Mol Life Sci. 2009 Feb. 66(4):553-8. Segal BH, Leto TL, Gallin JI, Malech HL, Holland SM. Genetic, biochemical, and clinical features of chronic granulomatous disease. Medicine (Baltimore). May 2000. 79(3):170-200.